2016 was a year of crazy politics, a few big changes for us as a family, and unfortunately, a year of sadness. We lost two close friends. They both died too young, leaving those of us who loved them behind to try to move on through life without them. Needless to say, I was ready for the new year. 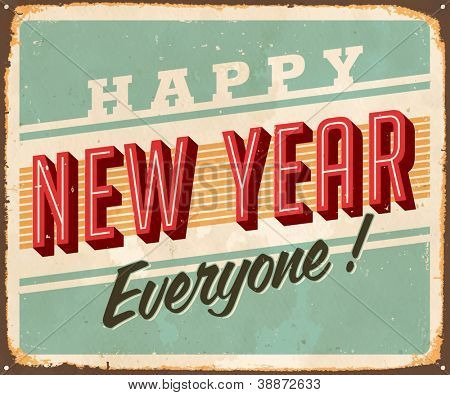 I know that time marches on and January 1st is just another day, but it does always feel like a new slate and new beginning to me. So far, 2017 has been fun. For starters, our beautiful Katie Bug has turned 15! I do not understand how this has happened. Because, for real, she looked like this yesterday, right? Brian was able to enjoy 11 whole days off over the holidays. He had been working 7 days a week, 12 hours a day for a VERY LONG time and we had thought he might have to work through the holidays, but it turned out that he was able to be off and thank goodness for that because he needed a break. We really enjoyed all the down time at home with just the 4 of us. So thankful for his job and the security it brings, but it’s nice to be able to have a break once in a while. I try not to set resolutions anymore because honestly, mine are always the same. Be healthy. Be happy. So, it’s really more of a regrouping and refocusing for me. With that being said, 2017 is going to be the year that I finally attempt Intermittent Fasting. Yep, intermittent fasting. It kind of goes against everything you’ve ever been taught about eating, so you may think I’ve lost my mind here, but bear with me. What is intermittent fasting, you ask? Well, to put it most simply, it is just fasting for a certain time period every day. There are couple of different ways you can approach it, but I’ll just talk about the way I’ll be doing it. Basically, I have a time window from noon to 8 PM that I can eat. Nothing after 8:00 and nothing until noon the next day. Pretty simple, right? But now you’re wondering why I would do that when I’ve been preaching for the last 4 years about eating within an hour of waking!!! Well, I kept seeing posts on Instagram from some of the fitness accounts I follow talking about Intermittent Fasting. I ignored it mostly at first because…well….the whole “fasting” part sounded awful. Then I started getting more intrigued, but didn’t really have time to fully investigate, so I just kind of read things here and there and kept it tucked away in the back of my mind. I didn’t really want to jump into it without doing my research first. Now that I’ve had time to research it, I’ve decided to give it a fair try. And if you’re wondering why I would want to subscribe to this seemingly crazy method, well, I have two pretty simple reasons. First, it is going to majorly simplify my life. If you are a meal planner, you know how agonizing it can be to sit there in front of a blank piece of paper and come up with 3 meals a day plus snacks that are quick, healthy, and that you are not sick to death of eating. Especially on days when I’m not feeling particularly creative or when I have a million other things on my mind. I just sit there and stare at my blank meal plan while the seconds tick by and everything else I need to be doing gets left behind. With intermittent fasting, breakfast is eliminated. In the morning, instead of getting up and immediately fixing myself something to eat, I just fix a cup of coffee (yeah, coffee is allowed. Black coffee. My fave). I then can do my morning chores, get the girls up for school, start a load of laundry, do my daily devotion, my workout, etc. The second reason I’m giving IF a try is that working out on an empty stomach, in simplest terms, will burn fat that is already stored in my body instead of burning off the nutrients that I consumed at breakfast. I’m not really changing what I eat but only WHEN I eat. Obviously by cutting out a meal, I will be consuming less calories, but it’s not a matter of restricting this or that. It’s just: You don’t eat until this time. And you stop after this time. Way easier than dieting, in my opinion. Are you worried about being hungry or feeling too sluggish to get through a workout on an empty stomach? I was too. The first two days, it did feel weird, I’m not gonna lie. I have been a faithful breakfast eater for years. I’m not a night eater, so not eating after 8:00 isn’t hard. But I always eat first thing upon waking, so that has been odd. But today was my 3rd day and I actually felt awesome this morning. I think like anything else, it’s just an adjustment that you have to make. So, that’s the biggest change I am trying to make in 2017. And it’s really more of an experiment a this point. I want to see what it does or doesn’t do for me and how it makes me feel/affects fat loss. In the initial stage so far, I am just loving the fact that I don’t have to plan out as many meals. It’s kind of pathetic how excited I am about that part of it, actually. I also walked my dog 30 minutes and tonight I’m going to do some yoga. Yoga is something I’ve done sporadically over the years. I know how important flexibility is as we age and after talking with Katie’s physical therapist a few months ago, he really convinced me that I need to incorporate it more on a regular basis, so that’s going to be another area of focus for me. Oh and I can’t forget this simple yet tasty recipe I wanted to share today. I love roasted vegetables in the winter. Well all year, actually, but especially in the winter. I know this picture isn’t the best but I was too lazy to try to make it look better. Forgive. Just take 12 carrots, scrub em. I don’t even peel them, just wash them and scrub them well. Cut ends off, then cut in half, then in half lengthwise. In large ziplock baggie, put 1/4 C olive, carrots, salt, pepper and some thyme or other seasonings to your liking. Roast on 400 for about 30-40 minutes. I served them tonight with a chicken and broccoli casserole. That’s it! Easy and delish! I hope you all had a wonderful holiday season and wish you health and happiness in 2017! 2 ½ – 3 cups cooked quinoa (About 1 ½ cups uncooked. Saute onion and zucchini in the friendly fat for about 7 minutes with a pinch of salt to bring out the juices and sweeten. Add the garlic and seasonings and cook a couple more minutes, then dump into a medium mixing bowl. Add the cooked quinoa, fresh spinach, tomato, eggs, and cheese to the mixing bowl with the sauteed veggies and combine everything together. Pour the quinoa mixture into a buttered 9×13 baking dish and spread it out. Bake at 350 degrees for 40 minutes, sprinkle Parmesan cheese on the top, and then bake another 20 or so minutes, until the edges are nice and brown and the cheese on the top is melted and golden. Right before we moved, I had started the New Rules of Lifting for Women program. I had a very hard time at first with letting go of my old split, which was to work certain muscle groups on specific days. However, I had read so many good things about this program and wanted to give it a try. Plus, as an added bonus, the workouts in this program tend to be a lot easier on my elbow, which if you’ve ever had tendon issues, you know how painful that is. Once we got ready to move, I got off track with that a little bit, mainly because my weights were buried under boxes in the garage, and resorted to just throwing some spotty workouts together for a while. Now that we’re settled in (for the most part), I’ve been hitting those workouts hard. And I love them. Although I must confess that I tend to throw a few finishing moves onto the end of each workout….I just can’t seem to not do that lol…but I’m really happy so far. I’ve noticed increased strength already and can’t wait to see where I’m at when I finish the whole program. Problem areas: LOWER BODY! Ugh! I know that when we lose weight it tends to go from top to bottom. First you notice it in your face, then shoulders/arms, abdomen & then finally the lower body. Unfortunate for people like me who really want to see results there first. Oh well, that’s the breaks! Gotta keep working hard & I know the results will come. This place where I’m at right now is hard for me to be in. I struggle with thinking that I am fine where I’m at, so why not just maintain it vs. I really want to reach the next level, but I’m scared of the hard work that will take! When you don’t really have X number of pounds to lose, it becomes more about changing your physique, which can be difficult to do unless you are willing to commit 100% to doing what it takes to make that happen. I get too comfortable with myself & motivation is lacking at times to tweak things that need tweaking. Oh and I’ve been slacking on water intake too. Man, what a difference that makes. I forget sometimes how important it is to be hydrated. It affects everything from your hunger levels to your skin, and energy levels too. When I’ve gone too long without water and finally have some, it’s like coming back from the dead. So that’s another area of focus for the upcoming weeks. 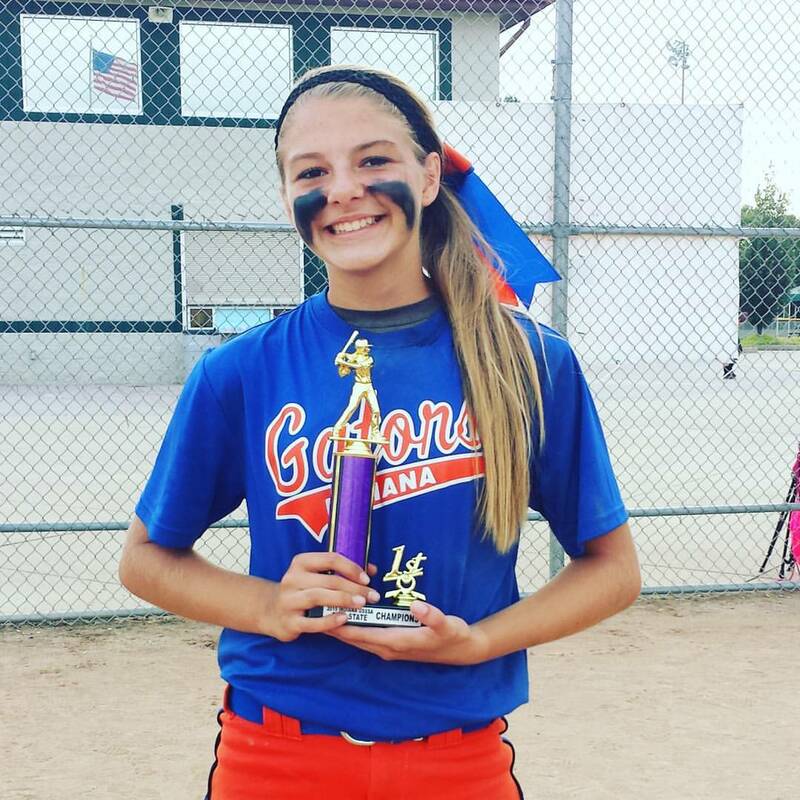 This past weekend, Katie & her new team, Indiana Gators, played in the USSSA Fall State tournament. 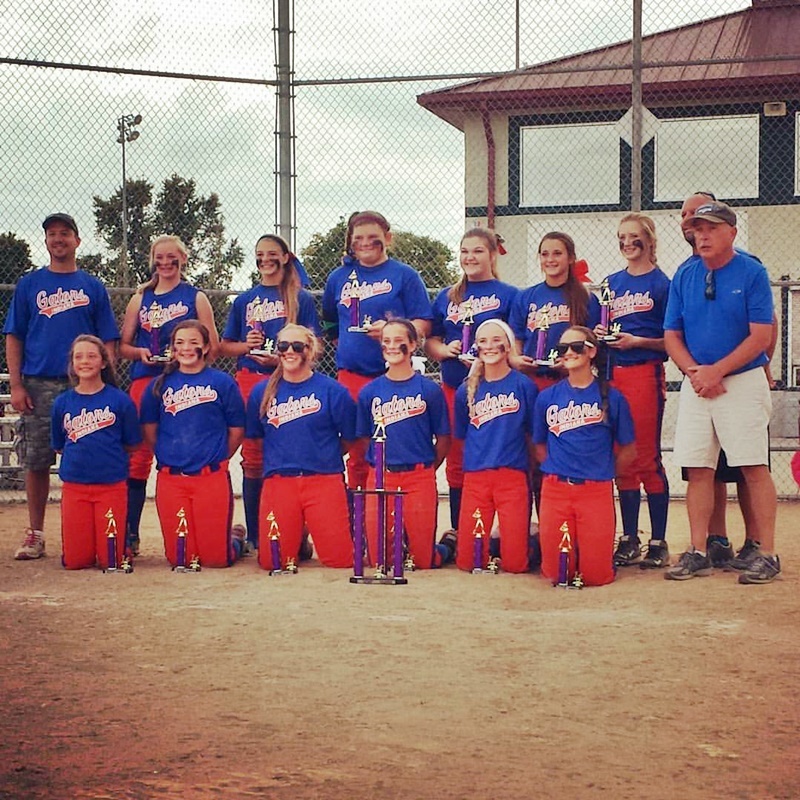 They went undefeated 6 games to sweep the “A” division of the tourney. And not only that, but Katie had an AMAZING weekend offensively & defensively. I am so proud of her hard work. It’s really nice for her to be able to see all of the time and sweat that she puts in (on her own time as well as at team practices) starting to produce some pretty awesome results. Not to mention that for a new team, these girls have taken to each other as if they’ve known each other their whole lives. They are a really fun group and have some pretty awesome parents and coaches to boot, which makes this travel ball thing so much easier given the huge amount of time we all spend together. Can’t wait to see these awesome girls in action again next weekend! I’m on the verge of deleting my Facebook. I’m shocked that I’m saying this because FB is something that I have thoroughly enjoyed, but I’m getting kind of sick of it, to be honest. Don’t get me wrong, it has been a great marketing tool for my business. And I truly enjoy being able to keep up with my friends and family on there. But, know what I don’t like? I don’t like when I feel obligated to accept a friend request from an “acquaintance” or a “friend of a friend that I kinda sorta know”. I also feel like I get sucked in to my news feed and quite honestly, I’m tired of scrolling through tons of crap just to get to something that I’m interested in seeing. I’m also tired of coming across something funny and then feeling the instant need to “share” it. I’m tired of feeling like I need to post pictures of everything we do. And that’s all of my own doing – I’m not blaming that on anyone but me. But that’s the way it feels and I’m just kinda over it. I miss blogging and the sense that I can post anything I want and only a select few will be reading it. I know I have the power to unfriend or not accept friend requests on FB, but there’s a whole other side to all of that. The whole deal where someone will see that you are friends with so and so, so why aren’t you friends with me? I don’t know…just sick of all that noise. I’ve been spending more time with the blog lately and going back and reading my old posts from years ago and I’ve been filled with so much joy at all of the memories. I just can’t get that with FB and I want to preserve these precious memories for my girls. I will probably keep my Instagram because I like how it’s not so involved. Plus, there are a lot of fitness accounts on there that I follow and actually want to see what they post daily. George & I are still making our weekly trip into town for groceries and errands. He’s getting a little slower and a little crankier, but he still manages to make me laugh. Sometimes without meaning to or knowing it. For example, every Thursday at Kroger, he throws his plastic grocery bags in the trash can and thinks its the recycling bin. No matter how many times I try to tell him he’s using the wrong receptacle. He does it every time. Makes me laugh. He’s a hoot, that George.